We stopped here for breakfast. Enjoyed eating out on Madeline Island...staff was friendly, the sticky bun and cinnamon roll delicious. We also had hot chocolate which was creamy, a farmers omelet and eggs Benedict....both came with hash browns and toast. 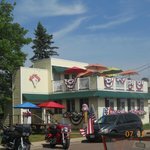 Grandpa Tony’s is a family style restaurant and is located on Madeline Island in the small vacation town of La Pointe, Wisconsin. It is also across the street from the Lake Superior shoreline, just a short walk from the Bayfield ferry dock. Madeline Island is one of the Apostle Islands (the only one you can live on) and is a short, 20 minute ferry ride from Bayfield, Wisconsin. They primarily serve American comfort food like pizza, burgers and ice cream cones. During the summer this place is open for breakfast, lunch and dinner and is open less as the weather gets colder. They have picnic tables outside in the yard, indoor tables and tables on a sundeck on the roof. I ate lunch here with my wife on a Saturday afternoon in late July and generally enjoyed the food. We did not have a lot of time so picked this place as it looked quicker than the restaurant across the street. We ordered burgers and fries at the counter and they gave us a number to find us when our food was ready. The burgers were decent and tasted OK (nothing special). Service was average as the place has a bunch of young adults taking orders and delivering food (just trying to make some money in the summer). There are not a lot of food options in La Pointe but this one is a decent choice if you are looking for a quick burger or pizza. We did not have any ice cream but this counter was busy and there were a lot of people sitting at the outdoor picnic tables eating cones. I would go back on my next trip to Madeline Island if I was looking for a quick bite. Great pizza and rooftop seating overlooking Lake Superior. Also had scrumptious ice cream to top off the meal and relaxed in adirondak chairs in their yard. The special pizza was delicious and their breakfast sandwich with bacon was amazing. Wait took a bit, but worth it. There is a green area next door the kids ran around in while we waited. It wasn't busy when we came and service was quick. Pizza looked good, as advertised, but we didn't try it. The ceasar salad wrap was really good. Cheeseburger also good. 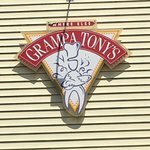 Been to Grampa Tony's? Share your experiences!